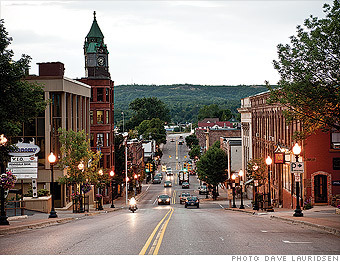 Marquette, Mich., offers a walkable downtown. As lovely as it sounds to sip margaritas on the beach, doing it year round can get old. This picturesque town on Michigan's Upper Peninsula offers outdoor fun for all seasons. With an average of 141 inches of snow a year, there's plenty of the white stuff for cross-country skiing and other winter sports. In summer, you can grab a kayak and start paddling on Lake Superior. And when outdoor activities grow tiresome, you can count your savings. A new three-bedroom townhouse with panoramic lake views recently sold for about $375,000. That's more than twice the price of the typical home here -- but 30% less than a similar property might have cost near Seattle. There's also plenty of low-cost and free activities. Retirees can take advantage of a wealth of offerings at Northern Michigan University in town. People 62 or older can attend classes free, and the affiliated Northern Center for Lifelong Learning offers low-cost diversions, from bird watching to dinner clubs. If all that excitement causes heart palpitations, you're in the right place: Thomson Reuters ranks Marquette General Health System among the nation's top 50 cardiovascular hospitals. Demographic information provided by Onboard Informatics. Median home price: Based on 2010 data. Cost of living index: The national average is 100; the lower a place's number, the less expensive it is. An index value of 95 means the town's cost of living is 95% of the national median. *Social Security and some pension income exempt. Baby boomers are buying their dream retirement homes -- years before leaving the workforce.